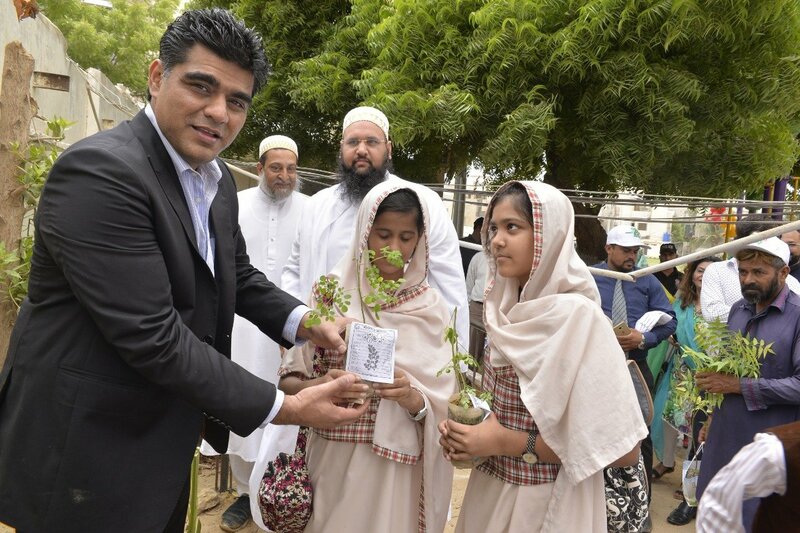 The Karachi chapter of the community’s Nazafat (cleanliness) Department organized a Plantation Program In celebration of The Independence Day of Pakistan, at AMSB School – Haidery Campus and at Al-Nadil-Burhani Haidery ground on 11 August. The occasion was graced by Dr. Imran Ali Shah MPA of Sindh Assembly, Mr. Riaz Haider MPA of Sindh Assembly, Mr. Rehan Hashmi Chairman of DMC Central, Professor Rafi-ul-Haq Ecologist from Horticulture Society and other government officials from various departments. The Program started from an introductory speech by Sheikh Ali Asghar Quetta Wala, Regional Coordinator of The Nazafat Department followed by the principal of AMSB who gave a speech in which he highlighted the importance of planting plants and the guidance given by Islam. Then there was a thoughtful and impressive skit on the importance of urban forests was performed by the Students of Grade 12 of AMSB. Appreciation Shields and welcoming bouquets were presented to the dignitaries by Al-Had-ul-Anjab, Hussain Bhaisaheb bin Sheikh Kumail Bhai. The students were also awarded Appreciation Shields for those who took part in the environmental painting submission. Guest dignitaries planted plants and appreciated the work of The Nazafat Department. The students and teachers of each class became the patrons of the planted plants and took ownership of bringing a green revolution in the area and distributed moringa plants to the parents.